Blog Do Dreamers from Tucson Dare Dream? Do Dreamers from Tucson Dare Dream? I felt acutely aware of being one of the only clearly Anglo faces in the room. The Pueblo High School cafeteria was crowded and hot; lack of air conditioning on a summer evening in Tucson is….challenging. But this was not the moment for first world complaints. My husband Jon and I were there to serve as volunteers for this meeting for the Dreamers and their families. Fortunately we speak pretty good Spanish, because that was the language of the night. Margo Cowan, a bilingual public defender had organized the meeting through the group Keep Tucson Together (http://www.facebook.com/KeepTucsonTogether) . Representatives of The Florence Project were there too. Both groups defend undocumented immigrants, both in and out of detention centers. Even though I felt like a useless foreigner (South Tucson sometimes feels more like Mexico than the U.S.), I was grateful Jon had encouraged me to come. An attorney and mediator, he had already made me proud by volunteering to represent people in court. This night was in response to the crisis that seems to threaten a whole group of people who had thought they were safe. Fear was palpable in the crowd of over 200 people. No one was there casually. 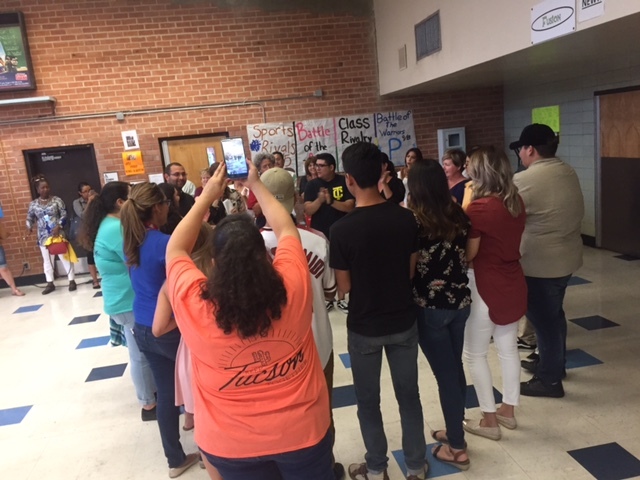 They were there to learn about their rights and about strategies for assuring that the Dreamer high school students could keep pursuing their education. ICE has been watching people they know are illegal and literally snatching them off the streets of Tucson. One man in court for a hearing was detained as soon as he left the court room. ICE agents dressed in black have reportedly entered homes without warrants and taken people away. People are now afraid to go to school, to drive to the grocery store, to walk to a friend’s house. A representative from Congressman Raul Grijalva’s office spoke, reminding the crowd of their rights. Everyone was urged to take a yellow and black poster home and put it in a window. “Law Enforcement: Do Not Enter without a Warrant!” Under Obama, many were deported, but only those who had committed a crime. Now it’s open season. I handed out application forms, since all DACA recipients have to re-apply to assure their status. The form asks for information regarding any interactions they have had with police, since if someone is victim of a crime, that could provide a reason for them to be able to stay. So would having parents or grandparents who are here legally. Of course now, DACA recipients may be wondering if it was a good idea to apply in the first place, since the government knows all about them. They had to pass background checks and submit proof of going to school or working. These are productive citizens, the cream of the crop. The Superintendent of Schools assured the crowd that the school is prohibited from asking their citizenship status; school is a protected zone. But it was hard to feel that, looking at the innocent, wide eyes on the Dreamer students who came up to the front of the assembly. The Superintendent shared the question that makes him saddest: “What will happen to me when I graduate?” He does not know what to say. A counselor acknowledged the students’ fears, and then reminded them they are not alone. They have the support of everyone in the room, and each other. When they linked arms and chanted, “Si, si puede!” I was afraid I might burst out into loud sobs. I saved those for the ride home. Since that night, a week ago, it seems Democratic leaders are trying to strike a deal with an unpredictable President. Will the bright light of possibility manifest as a real change in law and practice? Do these Dreamers dare dream? Do we? Note: This post will also appear in Huffpost, as part of their current theme, Listen to America, based on their nationwide bus tour.